Flavored vodkas have gotten a bad rap. It’s not tough to understand why: the ABC store shelves are lined up wide and tall with everything from whipped cream to mango and coconut flavors. These artificially flavored vodkas have become the norm. That’s why we should take a second look at hand-crafted flavored vodka. Opposite to above, these are made by using only natural ingredients and often local agriculture, too. Fair Game Beverage Company, located a mile east of the courthouse in downtown Pittsboro and tucked back in the woods off Highway 64, has been making fantastic flavored vodka for a few years now. 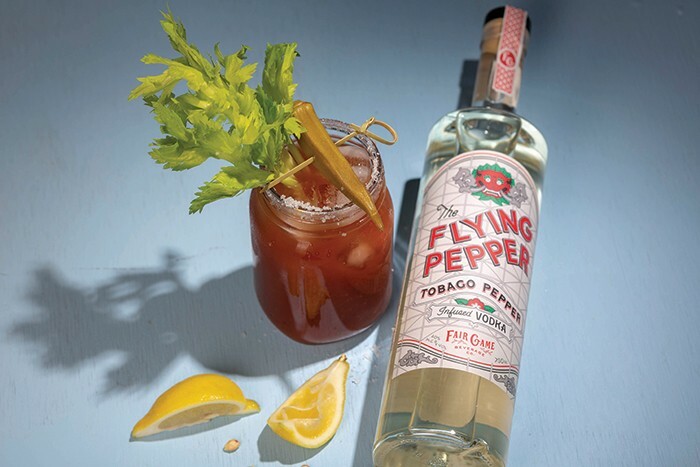 Flying Pepper Tobago Infused Vodka is flavored with Tobago peppers. They capture the “mysteriously smoky, sweet with just a hint of heat” notes by infusing the peppers into organic wheat vodka. What’s even better than it being all-natural? Fair Game Beverage only uses local peppers, working with North Carolina farmers to specifically grow the amount they need. So, let’s get to tasting. On the nose, there’s a lot of unexpected complexity here for a two-ingredient vodka. The spice of the pepper hints at heat while the sweetness of the wheat counterbalances it perfectly. At first sip, it’s a bit reminiscent of biting into a fresh hot pepper from the garden, but then, there is that smokiness. It’s not too spicy or lingering hot, and it has a long and full finish. This is such a lovely vodka. I highly recommend a perfectly served bloody mary cocktail! This straightforward cocktail will let the vodka shine through. No premade mix needed. Optional: Jazz it up with a tiny bit of horseradish or wasabi if you are craving more spice and heat. Shake all ingredients with ice. Pour directly into glass of choice, and garnish as desired.